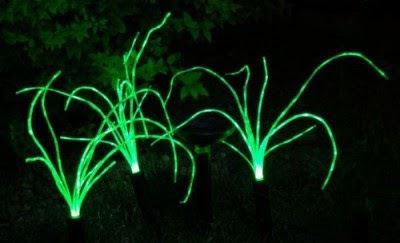 If you’re looking for something a little different as far as solar lights go you could pick up these Wild Grass Solar Garden Lights. You can jam the stakes into the ground and make it appear as if you have random tufts of grass glowing in the dark. If you have any extra gullible friends you could always convince them that the grass is a special variety that glows every single night. The set includes 3 sprigs of grass packed full of LED lights. Then of course there’s a handy little solar panel that charges up the rechargeable battery all day long. At night the lights kick on automatically and then shut off when the sun starts to come up. In order to run it’ll need 8 hours of sun to run for 6 hours in the evening. You can choose to keep the light steady or to flash. You can purchase it for $19.95 through Amazon.